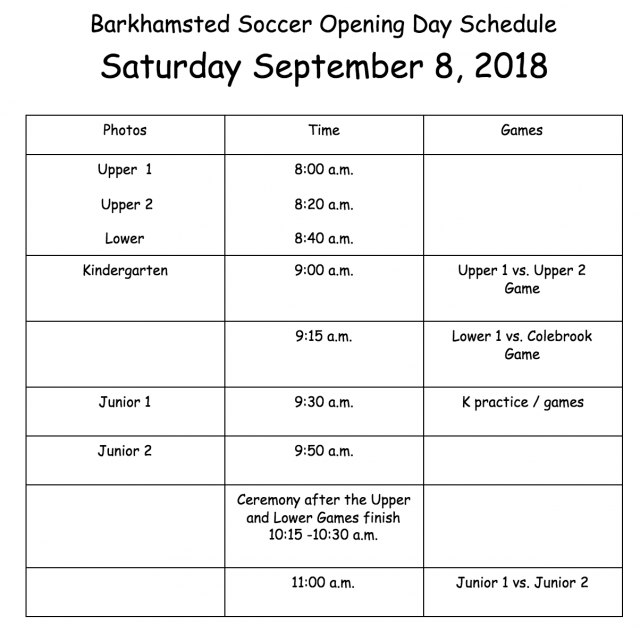 This Saturday, September 8, 2018 is Opening Day for Barkhamsted Soccer ! Below are links to the opening day schedule for pictures and games. Please take a minute to review the day as we have pictures prior to your game, so you will need to arrive earlier than what your coaches have requested. Uniforms will be distributed this week at practice! Also attached is the photo ordering form. Please print and fill it out prior to arriving at the field as to not delay the taking of pictures. Amy Sharon of Still Life Studios is again providing the photo service. She does a fantastic job and we are happy to have take both individual and team photos for all the soccer families! Please make every attempt to stay a short time after your game or arrive a few minutes early to participate in the Opening Day ceremony. This short 15-20 minute event will consist of a brief opening rally and our traditional 'running of the field'. This will begin at the conclusion of the Upper and Lower games at about 10:15 - 10:30 am. We will again be hosting food and swap tables throughout the morning. If you have any old cleats or shin guards you would like to donate or swap, please bring them on Saturday! We need donations of food and drink for the food table. If you can help us out with a small donation, please click on this SignUp Genius link and indicate which item you can donate. Our league runs because of the many volunteers. Do your part and help out in a small way with a food donation or by sitting at the table for a bit! Thanks in advance. Thanks, and looking forward to seeing you all on opening day! We also need volunteers to staff the tables. The SignUp Genius Link also has spots for you to volunteer to staff the tables for a short time on Saturday Morning.